Olympas (Greek: Ὀλυμπᾶς, meaning "heavenly") was a Roman Christian whom Paul of Tarsus saluted (Romans 16:15) in around 65 AD. 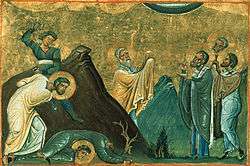 Olympas is regarded in the Orthodox Church as being one of the Seventy disciples. His feast day is November 10.